Fred Armisen will direct a live stream of an upcoming Kings Of Leon concert for the digital series American Express Unstaged. The Nashville band's August 9 concert at London's Shepherd's Bush will be webcast globally on Vevo and YouTube, a spokesman for American Express said. Armisen, who left Saturday Night Live earlier this year, is also a drummer and has previously directed music videos. It's the 13th streamed concert for Unstaged, which pairs top music acts with notable directors. The last instalment was a stream for Vampire Weekend directed by Steve Buscemi. 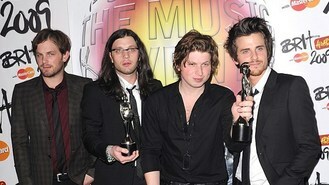 Kings Of Leon will release their sixth album Mechanical Bull later this year. Rapper DMX has been arrested in the US and charged with driving under the influence. Rita Ora has joined the line-up for a concert to be held in memory of Stephen Lawrence. Idris Elba will swap his gritty detective role in Luther for a chilled-out vibe by joining the line-up for this year's V Festival. Robin Thicke has put his recent success in Europe down to his sound coming back into fashion. Lady Gaga is set to make her return to the stage at the MTV Video Music Awards. Timbaland has said he does not approve of Drake and Chris Brown's posthumous collaborations with Aaliyah. A council has accepted that putting parking tickets on Bruce Springsteen's tour trucks ahead of a landmark gig by The Boss was "a little embarrassing". Music industry experts have expressed their surprise after a band's fan-funded debut release sneaked into the midweek top 20.